When a girlfriend spoils you with your favourite chocolate bars, you make double chocolate cookies. It’s just what you do. No questions asked. The other day I realized that I don’t have many nut-free cookie recipes on the blog. Sure, my most popular Vegan Chocolate Chip Cookies are nut-free, but there really isn’t much else that I could think of. 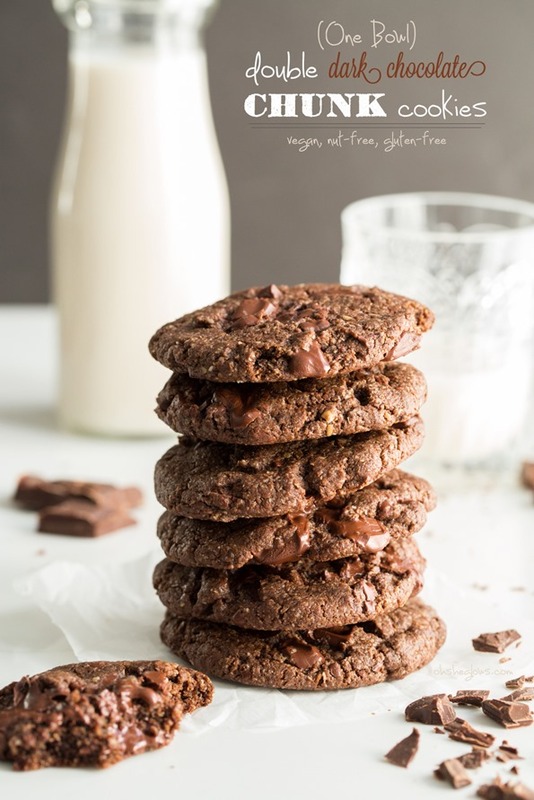 In the name of comfort food and all things right on this blog, I decided to create the perfect crispy-on-the-edge-chewy-in-the-middle gooey double chocolate chunk cookie – free of nuts! ~ as I mentioned, these are nut-free! ~ it’s a one bowl recipe. I even made the flax egg in the same bowl to save dishes. I’m not messing around here. No sir-ee. 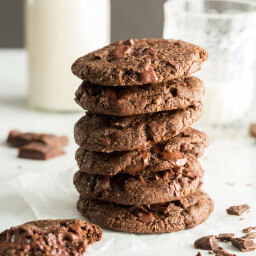 Gooey, rich, double chocolate cookies made with whole grain oat flour. These will satisfy your every chocolate craving and then some! This recipe is adapted from my Crispy Peanut Butter Chocolate Chip Cookies. Preheat oven to 350F and line a large baking sheet with parchment paper. In a large mixing bowl, mix together the flax and water and set aside for a few minutes so it can thicken up. Whisk the flax egg again once thickened. Add the rest of the wet ingredients into the bowl with the flax egg (coconut oil, sunflower seed butter, brown sugar, cane sugar, and vanilla). With a hand-held electric mixer, beat the ingredients until combined and smooth. Now, beat in the dry ingredients, one by one, as you go down the ingredient list (baking soda, baking powder, salt, cocoa powder, oat flour). If your dough is a bit dry, add a teaspoon (or two) of non-dairy milk and beat the mixture again. The dough should be moist enough to form balls without cracking, but not super sticky. Finely chop the chocolate (it should be the size of peas). Beat the chocolate into the batter or simply stir by hand. Shape balls of dough (about the size of a golf ball or 2 heaping tablespoons) and place on the baking sheet 2-3 inches apart. Gently press down on each ball with your hand to form a disc (it should be 1/2-inch thick or so). Bake for about 12-13 minutes (I baked for 13 mins) until the cookies are spread out nicely. Cool cookies on the baking sheet for 7 minutes or so and then transfer to a cooling rack for another 10-15 minutes. To bring out the chocolate flavour even more, try sprinkling the cookies with a tiny amount of flaked sea salt before going into the oven. To make this recipe soy-free, use a soy-free chocolate such as Enjoy Life brand. I’m excited to let you know that The Oh She Glows Cookbook Virtual Blog Tour kicked off yesterday! A big thanks to all the wonderful bloggers who are participating, making recipes, and sharing the book with others. I’ll be linking to blogger reviews as they come in, so keep your eyes peeled. You can also find all the reviews on my Book page (the list will be updated frequently). Be sure to check out their posts for some cookbook recipes and sneak peak photos of the book! Many of you have been sharing social media pictures of the OSG cookbook in local bookstores, as it arrives in the mail, and recipes you’ve already made (keep in mind most retailers haven’t shipped yet, but Indigo is shipping early! Most books will ship on March 4th). So much fun. Please keep sharing your photos on twitter, Facebook, Instagram, and Pinterest using the hashtag #osgcookbook and also tag @ohsheglows #ohsheglows so others can see what you’re making too. Thanks again for all your excitement and support!! Last but not least, I’ve been asked for a Sketchie update. Thanks for your comments, personal stories, and thoughts about Sketchie in my last post, by the way. The surgery went well and he has been at the vet’s clinic under their supervision for a couple nights. Miss him greatly!! It’s amazing how many times during the day I go to do things “for Sketchie” only to realize he’s not home! I’m picking him up this afternoon though. Fingers crossed he is in good spirits and doesn’t hate me! these look magical! i cannot wait to make these- dayv will go crazy (thank you for making them gluten-free!). also, i made your gf graham crackers over the weekend and they were phenomenal. I’m drooling! Just got the goods to make those blueberry banana muffins! I got sent to your blog by my sister and it’s gorgeous, love it. These look amazing. Thank you Louise, glad to hear that! I might not even make it to the oven with these, bowl+spoon DONE! these look perfect – might have to add them to my Academy Awards menu! The dish-washing hater in me is LOVING these! One bowl recipes are where it’s at if you ask me. :) I’m so excited to check out some of the other reviews and can’t wait to post mine on Monday! 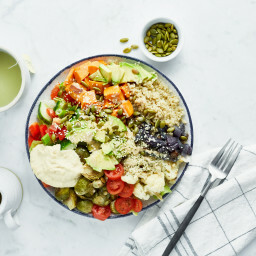 Wow, this looks so delicious ! P.S. My husband and pour through your recipes together and ALWAYS look forward to you updates. We also put an order in for your new book; thrilled to support you and all your efforts, because you’ve single handedly helped us navigate the Vegan lifestyle. I’m so happy to hear that, thanks so much! Those just are to diiieeeeee for. Perfect chocolate love fest cookie! Great for gifts, especially for women! I saw your book arrived at my local bookstore today and I just wanted to say it looks beautiful and the recipes look delicious! Oh my goodness…how can I look at these and NOT want to make them!? YUM! These look amazing! I especially love all of the chocolate and the use of just one bowl – can’t beat that. Thanks for sharing :) I’ll have to try these out one weekend. These cookies are a total keeper! They look perfect! Wow, these look awesome. I’m going to make them ASAP! And welcome home to Sketchie…I know he will get plenty of TLC!! Oooh I’m loving the looks of this recipe. I can’t wait to give it a try! I definitely need to make these… pretty sure I would be the BEST wife ever, it’s been a long time since I’ve made cookies! I wish I had a couple of these sitting in front of me right now! They’re just what I need to get through this afternoon! I literally just came to your website to browse the cookie recipes for something chocolatey to make tonight. Thank you for reading my mind – these look PERFECT! I’ve been on an OhSheGlows bender this past year (maybe longer? I’m just addicted to your site) and absolutely cannot wait to get my cookbook next week. I’ve already planned to hole myself up for a cooking marathon next weekend! Going to go read some of those reviews to get myself even more excited! Thanks for everything, Angela! It was fate! ;) Thanks for your kind words…so glad you are enjoying the blog! These look ridiculous! 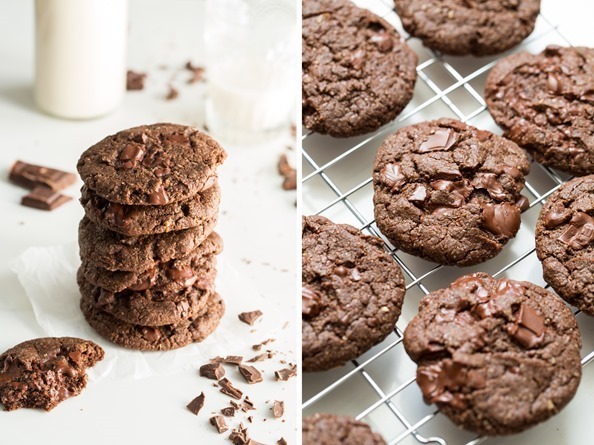 I always said I wasn’t keen on chocolate cookies but I’m 100% certain that this recipe will change that! I’m so glad you posted these! When I saw your teaser pic on Instagram the other day, I made a pact with myself to bake them this weekend if you posted the recipe. Can’t wait to try these! This recipe seriously has everything going for it…one bowl, approved by a man (always an accomplishment), and crispy-on-the-edge-chewy-in-the-middle. Oh, and vegan, of course. Perfection! They look amazing. I’m new to your blog. I just pre-ordered your book and received the free recipe bundle. This morning I made the -Eggnog Spiced Cashew Milk- and WOW is that good. Never had vegan eggnog before. I’m super excited to incorporate more vegan dishes/ meals into my diet. I’m going to make your – Luxe Chocolate Pudding- this weekend after I shop for raw cocoa. So glad Sketchie is ok. Cats are incredible creatures! Best of luck! I’m thrilled to find your blog! I LOVE that the only grain in here is rolled oats. I can’t wait to make these! Thanks for the update on Sketchie, glad to hear his surgery went well. Hopefully you will have some answers soon. These cookies look amazing! I’ve been craving chocolate so these are perfect. I can’t wait to get your book and start making recipes! I’ve always loved everything I’ve made from the blog. I am definitely checking out the virtual book tour, so fun! These look deeeelish! (as always) I’m ordering your cookbook tonight and can’t wait! :) Question, do you think I could sub coconut sugar for the sugars in the recipe? I used coconut sugar and they turned out great. Oh my gosh, I literally moaned out loud looking at these pictures! You continue to amaze and inspire me, missy. 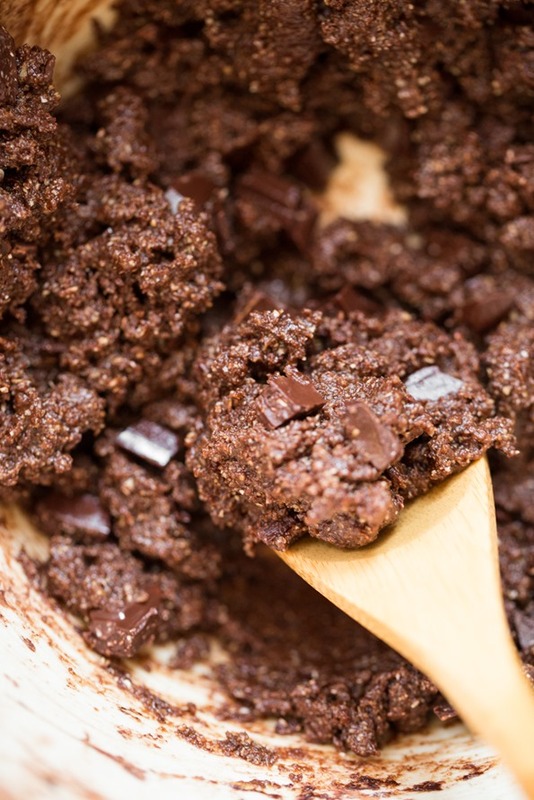 I’ve been looking for the perfect chocolatey cookie recipe for awhile and THIS ONE LOOKS PERFECT. Nothing else has made it past my picky cookie standards. I can’t wait to whip up a batch of these and surprise my girlfriend with them! Oh yum! Looks like a terrific, and quick, treat. Ahhh these look so amazing! I love all the nutritious ingredients in there, but it still has lots of tasty goodness in there too! I am in a big cookie craving phase right now, luckily I am running a lot of miles right now so can burn them off! As long as I dont make them again during my 6 weeks before my peak half marathon this spring! These will be dangerous! Thanks so much for the recipe! Yum, yum, YUMMY!! Can’t wait to try these! I’ve been so excited counting down the days until my new favorite cookbook arrives! Congratulations, Angela!! It’s been so wonderful following you for so many years and to see your evolution and cookbook creation! What a neat journey! I started gathering the ingredients even before I finished reading the recipe, and the cookies are just out of the oven! I ate one, hot and right out of the pan. It’s delicious!!! Love the ingredients, texture, taste and look!! I am a cookie-addict and these are delicious!! I made them with peanut butter and my husband nearly finished the whole batch in one evening!! Well done!! I will be making these again for sure! I’m so jealous of the people who got their cookbooks early! NOTHING I have ever made from you has ever disappointed. I’m so excited for next week! Yum! These look so tasty and I love the look of the texture and can’t wait to try them! Congratulations Kaitlin! You were the very first commenter out of many that actually made these cookies, rather than just commenting on how mice they looked. Baffles me, but there we are. Angela, I also made these today, (using coconut sugar and agave instead of sugar) and they don’t just look great, they are sublime. You are indeed a master in your work, and the book is splendid, as are the bonus recipes. Many thanks. Thanks for an inspiring recipe too – we are going away to ski for a few days and I needed to bake some goodies to bring along. These are now on the agenda for the day! Congratulations on the cookbook! I’ve got my copy already and am loving it! I was wondering about getting in touch to do a review on my blog (www.healthyeatingandliving.ca) – What is your email address? Gorgeous photos, as usual. Thanks for your inspiration and hard work! My mouth started watering…these look incredible! Will have to try them! Great tip about the oat flour. Can’t wait to try this recipe. They look amazing! These are perfect for my kids’ lunch boxes…maybe we’ll make them this weekend! These look magic :) Gonna try them tomorrow!!!!!! Can you substitute the cane sugar with coconut palm sugar? These cookies look like the perfect cure for the end of a hard week! I can’t wait to make these, and I will definitely be making them this weekend! I tried your banana blueberry muffins (I used whole wheat pastry flour and whole wheat flour because I didn’t have spelt) and they were amazing! Loved how easy and delicious they were! Hope Sketchie comes home soon and has a speedy recovery! Would they turn out as well without ground flax? I can’t find it in Italy! Sounds heavenly! Just wondering, what would you recommend to use instead of the 1/3 cups of sugar? and how much? wow – can’t beat that check list. You’ve got it all covered. These look fabulous! These look fantastic! I’ve been looking for a good vegan cookie recipe that doesn’t call for vegan margarine. I feel like I use too much of that stuff, and it isn’t the healthiest. I am so glad to hear Sketchie is okay – I was thinking of him! Just last night I was thinking “I should make some cookies” and here’s a perfect recipe! I’m going to make them tonight. I’m also greatly anticipating your cookbook! I have it preordered and I can’t wait! Oh my gosh, these are so good! I came home from work and made them right away! Hey Angela. These look amazing and I can’t wait to make them. I just made your gluten free vegan brownies and my 3 year old was giggling with glee every time I added more chocolate! However, we were dying when we saw that we had to wait all night for them to set- so we of course had to indulge for breakfast- delicious! Anyway, did you make your own sunflower seed butter for this cookie recipe? if so, how do I make it, if not, where do I buy it?? Thanks for all your amazing recipes. Can’t wait for my cookbook to get here next week. DON’T BOTHER MAKING A SINGLE BATCH! Holy cow they are amazing! We knocked down the first batch in one night. Ok, just made these tonight. They came together quickly and were Awesome! Of course they were. Everything I’ve made from your site is great. A bit embarrassed that I let my 3 year old eat 3 of them. But they’re healthy, right? I used pb instead of sun butter and still great. Can’t wait for the cookbook! These are just amazing from batter to baked! I didn’t have the exact ingredients but was so excited to try this recipe, so I used raw cacao instead of cocoa, and subbed a little over 1/3 cup of coconut sugar for the brown and white, and they were still perfectly sweet, chocolatey and so delicious! My husband was drooling at the oven and our house smells so yummy. Thank you for another amazing recipe! SO easy and tasty, definitely a recipe I’ll be make for a long time to come! Sending lots of cat hugs Sketchie’s way. It’s amazing how different the day is when my dog isn’t around -even if she’s just at the groomer’s. I work from home most of the time and while I’m “alone,” there’s always my dog there to take care of and talk to. I’m sure Sketchy will give you a big ol’ cat hug when you pick him up! Made these yesterday and they are so good! Looking forward to the cookbook! Picked up your cookbook at B&N today! I just made these today and they are really good! Kid-approved too! Thanks so much. It’s a great recipe. Ever since I found your blog about a month ago, I’ve been making at least 2-3 recipes of yours per week and I love ALL OF THEM! Yesterday’s dinner was your roasted tomato, onion and basil pesto pizza. It was so good, I had the leftovers for breakfast because I couldn’t wait until lunch time to have it again lol! Today- these cookies. 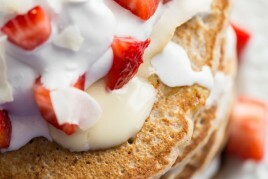 Tomorrow morning-strawberry shortcake pancakes. I ordered your cookbook and I can’t wait until it arrives. Keep up the great work! I made these last night, they are so good!! I used a chia egg instead of flax because I don’t have any flax right now and it worked just fine. I baked these today, and they were such a hit with my non-vegan family! :D These were just so awesomely good! Usually I’ll just have half of one cookie in a day, but I had TWO whole ones fresh from the oven xD Tossed them back with a glass of unsweetened vanilla almond milk and was in chocolately heaven. I’m not GF, do you think they would turn out the same with white whole wheat flour? I think it should work, however you might have to use a touch less flour but I’m not sure. I just made these and they were sooo good, I finished them all in 2 days. I just loved the chewy cake- like texture. I used my food processor instead of a mixer and only used 1/2 cup sugar total. I also made the ‘Best ever chocolate pudding’ from this blog as a dipping sauce and even started making cookies sandwiches ( yes i was having intense chocolate cravings!!). Next time i am going to use cinnamon instead of cocoa and raisins instead of chocolate chips.. Yum, i cant wait :)!!!! Angela, i just love how your recipes always turn out amazing. Truly looking forward to your cookbook..
All about easy cleanup – love this! They were delish! All gone! Thank you for your creations. I almost prefer eating them w/o baking…yum! For those whose digestive systems can’t handle flax, I use a “tapioca egg” from Enjoy Life Foods. It’s an awesome substitute. One egg is equivalent to 1/3 cup of tapioca egg. It’s snowing where I live in the Mid-Atlantic, which always means baking! I made these cookies this morning and they turned out great. I stuck with it after adding the oat flour beating the mix until it came together, which took a minute or two, but I didn’t need to add extra liquid. I was intrigued by adding the sea salt to enhance the chocolate flavor, so I tried that on half. Love this cookie! I can’t wait to check out your cookbook Ange. It looks amazing!! I’ve been cooking from your cookbook constantly recently, with consistent 9.5/10 ratings from my three kids (a rare achievement even once!). I’ve been praising the recipes to anyone who will listen, including my fellow employees at a national Canadian book retailer. My husband couldn’t believe the savory oatmeal and lentil bowl didn’t have cream or cheese in it like risotto! My hands-down favorites are the chocolate smoothy and the salt & vinegar chickpeas. You turned simple ideas into something mind-blowing and delicious! My sincere thanks! Thank you Robin so much!! That is so great to hear. :) I’m so happy you enjoyed the savoury oats too – I know it’s not for everyone, but I just love it! I made these cookies last night and there are only 3 left. They are amazingly good! These cookies look delicious! Is there anything you’d recommend besides coconut oil? Mine are in the oven! …except I think I may have added too much almond milk at the end (It was hard to mix so I started with 1 teaspoon). Fingers crossed…but really it can’t go that catastrophically because the dough tasted AMAZING! Will be a nice dessert after your “Favorite Vegan Chili” … keep doing your thing! We SO appreciate it! p.s. Wrote a review about your blog on mine (backporchronicles.blogspot.com). Hope you can check it out if you have time! Made these last night and they were delicious! I subbed pumpkin seed butter for sunflower and it turned out great. Today I was craving chocolate and went on Allison’ blog to find a perfect healthy chocolate chip cookie. I am soo impressed! The recipe is amazing and delicious! It has hints of coconut and flax and very rich chocolate. VERY GOOD! You gotta try it! Angela, I just made these cookies (they barely got in the oven), and my husband is already asking me to make another batch so that we can devour all of these tonight. These are to-do-for! Best chocolate cookies ever! I received your cookbook early and have been enjoying it and raving about it ever since! We have had Oh She Glows recipes daily and are loving it. Thanks for your hard wrk creating and sharing such amazing recipes! AwesomeSauce! I shared these on my FB – I used almond butter and coconut sugar + 1 Tbs Blackstrap molasses (I don’t keep refined or brown sugar in the apt). They are SOOOO good I’m already going to have to make another batch tomorrow. I bet the dough freezes great too – has anyone tried that? Definitely needed the electric beater though. I tried by hand but gave up pretty quickly and dug my ole’ beaters out. Thanks for another killer treat! These look amazing! I just got your book in the mail! It is absolutely amazing! I hope your write another one in the future. The added tea recipes are such a nice bonus. I’m really excited to try them out! And lastly, the pictures look amazing! I could read your cookbook every night! I received your cookbook last week for my birthday (so excited!). Is it too late to get the bonus ebook? I have been urging my boyfriend to find the receipt, but I can’t remember where I am supposed to submit the information from it. Whoa! These look AWESOME!!! I bet adding dried cherries would be a really good touch to these beauties!! I have already made these twice in three days!! They are so ridiculously good!!! My 4-year-old son is allergic to wheat, milk, egg, and all nuts and I have had quite the time finding good recipes for treats that both taste good and don’t take a million different flours. These are seriously the best chocolate cookie I have ever had. Total keeper of a recipe…thank you so much!!! Just made these cookies using peanut butter as a substitution and they are so good! Love this blog and all the recipes on it. Thank you! These look like everything a cookie should be: gooey, chocolate-y, chewy. Yum! what can i use instead of oats as a gluten free nut free substitute? Oh, these look incredible!! They’re being added to my to-do list for this afternoon! Just made these! Managed to wait ten minutes before trying one…they’re really delicious and feel like a “grown up” chocolate cookie thanks to the dark chocolate and cocoa. I hadn’t any flax in so simply added a tinsy bit more almond milk, no noticeable downside! Wow! Made these 2 days ago and about to make my second batch, seriously yummy!! i used PB and opted to not bake! a glass of almond milk. Hi Angela. I was very excited to make these cookies – which I did today. After the requisite cool-down period, I ate one and it was very hard. Too hard for my liking. They’re still hard now. I’m not sure what happened. The only sub I made was 2/3 cup cane sugar (I had no brown sugar on hand). I just made these! WOW totally amazing. SO yum. I cooked them for a little longer as I like them quite crunchy :) And they were still good and chewy on the inside. Thank you so much! We have been making these almost every night since we tried them. I cannot believe how good they are! Last night we added chunks of Dandies vegan marshmallows to the batter before cooking — it was incredible!! Absolutely awesome. Kid approved – that says it all! These were amazing and didn’t leave you feeling heavy. I used raw cacao powder and Ghirardelli semi sweet chocolate chips. So yum! These tied with deep-dish, gluten/egg/dairy-filled M&M cookies at a bake-off! These are ridiculously amazing!!! I just pulled mine out of the oven 15 mins ago and have already eaten one. I used raw cacao powder and subbed the sunbutter for almond butter. Seriously some of the best cookies I’ve ever made/eaten! Thank you!! Just had to say… I left out the cocoa and chocolate bar, added 1 tablespoon cinnamon, 1/3 cup chopped walnuts and 1/3 cup raisins and ended up with the best oatmeal cookies I have ever tasted! I had to play around with your recipe because my husband caught me stuffing my face with the chocolate version and accused me of not loving him (he hates chocolate – I should be so lucky), so I dissected your recipe and now he feels all warm and loved inside… and now I am heading back for seconds from the cookie jar – haven’t yet decided which I prefer so I’ll just settle for a nibble of both types of cookies! Oh… and I used smooth almond butter instead of seed butter and cooked the plain cookies for 14 minutes for a crispier cookie. I made these last week – they were incredible! Do you think this (and any of your cookie dough recipes) would freeze well as dough? I want to make a big batch to keep on hand for quick baking to take to new neighbors, but didn’t want to waste these ingredients if they won’t freeze well. Thanks! These are fabulous and easy! Whipped up a batch this evening, using peanut butter as I was out of other nut/seed butters. The flavor doesn’t come through, but performs its function well. The cookies are not too dense, and not too sweet…great for when you can’t decide if you want a brownie or a cookie! :) Good work!! The sprinkle of sea salt on top is pretty rad on the taste buds too! Just finished making these. Doubled the recipe and so glad I did-yum! They won’t last long! glad you’re using earth balance less in your recipes! Just made them today but I had to use peanut butter instead of sunflower seed butter and vegan margarine for coconut oil. They tasted AWESOME and there are only three left (out of 15)! 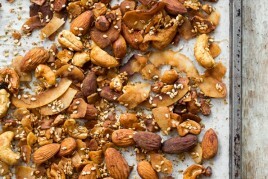 I added cashews and walnuts to half of them and it turned out great since I love all kinds of nuts and nutty flavors! I made these a few days ago and was so impressed! The cookies were so good! They even broke my almost one year silence on my blog :). Thanks! THESE.WERE.AMAZING! So, so, so delicious! Next time I will make a DOUBLE BATCH as these did not last long at all! Made these tonight and they are sooo good!!! I substituted almond butter for the sunflower seed butter. It’s taking a lot of will power not to eat all of them! Hi, I made these today. They tasted really good by came out really flat and crunchy. Did I do something wrong? I figured it out. I cooked them too long. I tried it again and cut the baking time and they were better the second time. I also processed the oats in the blender to get the flour to be finer. Even though they were really hard and crunchy the first time we still ate all of them. These were a big hit when I made them! Last night, I used the same base recipe for chocolate chip oatmeal cookies– turned out amazing! Thank you. I just made these yesterday, and they were DELICIOUS!!! I used gluten-free oats, cacao powder, and almond butter. Thanks for the heavenly (and easy) recipe! Just made a batch with peanut butter…they were great! i wanna try the applesauce as well did your turn out crunchy o chewy? I made these this afternoon and they are AMAZING! My husband and teen boys ate them all! Thank you – will make them again and again. I love these cookies, so did my kids and my meat eating ”I don’t believe in Vegan’ husband. I added some chopped cranberries, raisins and added some chia seeds. Love your site, love your cookbook. It’s so pretty to look at and so delicious! Congrats on all your success, professionally and personally. So I made these in my house in Salt Lake City at 4500 ft and they were delicious and were nice thick chewy cookies. I made them at my sisters place yesterday in Seattle at sea level and they were totally flat. Any suggestions??? O.M.G!!! You have done it. Every year at thanksgiving time we make huge batches of regular, non-vegan, non gluten-free cookies. It’s a tradition and so much fun. A few times I tried to pick a few recipes that were vegan/gluten free… each one a miserable failure because they didn’t live up to the regular cookies. My family had all but banned me from picking recipes for cookie day. Well… until THIS recipe. 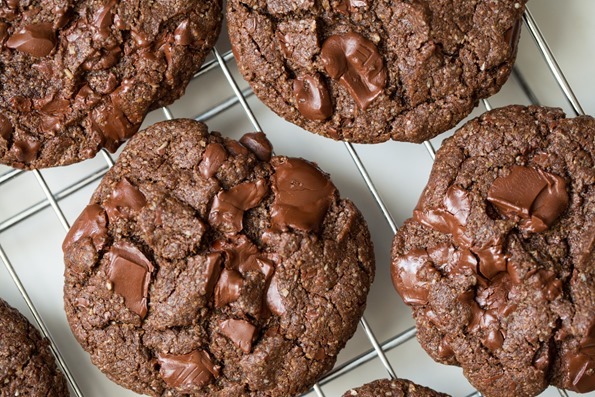 I made these today and when my each member of my family bit into these chewy, decadent chocolatey cookies their eyes got wide and declared them FABULOUS. You could serve these at any cookie exchange/party and not be able to tell them apart from regular egg & flour cookies. Angela, you are my hero :) BTW… your cookbook is now my kitchen bible. Happy Easter!! Angela I just made these cookies and they were incredible! I did make a few changes, though. First of all I have a missing part on my food processor and couldn’t make the oat flour, so I just used gluten-free all purpose flour instead. For the sweeteners I used 1/3 cup of extra dark palm sugar and 1/3 cup of fresh date puree (extra fibre and no need to add extra liquid to the batter). They taste so good and I can’t wait to take it to the girls at work tomorrow. Thank you, thank you! These are amazing! My brother and I both loved them. I’m going to make them again this weekend, but with peanut butter chips instead of chocolate. LOVE. Thank you, Angela. Your recipes never fail me. Update: Made them with peanut butter chips tonight. HOLY COW, soooo gooood. My brother said they taste like a fancy, 1,000x better version of those no-bake chocolate peanut butter oat cookies. I’d have to agree! Thanks again, Angela! BESSSSSTTTT cookies ever im not vegan and I would take these cookies over any other cookie! My husband and i have been vegan for about 4 months now and i couldn’t stand not having any cookies any more, so i made these and we fell in love with them! since the first batch i have made them three more times! They taste even better than they look, I am hooked for life! Thank you sooo much for this great recipe! These cookies were decadent, rich, and full of all sorts of new tastes! The sunflower seed butter and coconut oil definitely added a special flavor! I used a super dark chocolate bar chopped up and semi sweet chocolate chips for extra gewy yummyness. I will be making these again!! 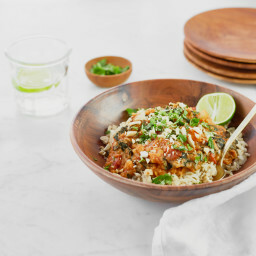 Hi there, really want to make this for gluten free and diary free guests tomorrow night but wondering if you can replace the GF oat flour with any other type of GF flour? Like almond meal or anything else? And if so, whether the amount needed would be the same? Very excited to make them, thanks! I made these yesterday for a get-together I have where one friend is gluten-intolerant and another friend is a vegan, so these seemed perfect! I’ll admit I was a bit skeptical (vegan AND gluten free seemed difficult to me), but they turned out very tasty! I ended up baking them for only 10 minutes at 325, but I would probably bake them for less time next time. They ended up being a bit dry, so hopefully less baking would help (I also added the extra plant milk, but I may add more next time). I want to try the oatmeal cookie version that one of your reviewers mentioned, but I’m out of coconut oil. Would another kind of oil work okay (canola, etc.)? these are good- be careful not to over bake! I would add a little toasted coconut next time to bring out the coconut oil flavour. Will make again! Hi im new to your website amazing looking recipes!!! I was curious do you list any nutritional information on your recipes? These were PERFECT! Chewy and a little crunchy. Chocolatey but it felt like a lighter dessert because of being dairy free. I used peanut butter and added 1/4 c white sugar. Great recipe! I have been admiring you website for quite a while now. Everything looks amazing. I am not a vegan but decided to make these cookies my first vegan-baking-accomplishment for my final yoga class of the semester as many of my fellow students are vegan or at least vegetarian. Even before I started I had quite a struggle as one of my cats hid the coconut oil (just kidding – she just threw it on the floor in order to sleep on the pantry shelf ;-)). The dough looked amazing, but the balls were very greasy. After a few minutes in the oven they spread out and became very flat. When baked they were also very greasy and became really hard when they cooled down. Can anyone help me figure out what went wrong? Did I use too much oil? Or did I make the balls too small? I love the idea of vegan deserts, but my first attempt really didn’t turn out too well. I just made these with hazelnut butter and they were absolutely amazing! I made them last night and my Boyfriend (not a vegan) is already begging for a second batch. Also, the sea salt is a must. your recipes are so GREAT! thanks for doing all this work. have a great day! Hi Angela, is there an alternative to the coconut oil? I can’t have butter or coconut. Any suggestions? I am going to have to make these on my cheat day, I think! that’s a good bit of sugar there……………………. This is one of my favorite cookie recipes! Instead of sunflower seed butter I use chunky peanut butter and I love the combo. These cookies do not last long in my house! Hey Rachelle, I’m not sure, but I would suggest reading through the comments to see if anyone has tried this recipe with another flour. Good luck and let me know how it goes! I just made these and they are SO good! I was a bit worried because my oat flour wasn’t completely smooth, but it turned out really well when I cooked them. I also added a tiny bit of espresso powder to intensify the chocolate. Foolproof recipe. These cookies have a real earthy, hearty texture to them thanks to the oat flour. Think of them more as a health food cookie.. These were super yummy! They were a breeze to make and perfect dessert for a weekend camping trip. I turned them into Mexican cookies by adding a bit of cinnamon and cayenne pepper and they turned out great. i love these cookies and have gotten my co workers hooked:) but I was wondering do you think I can use coconut butter instead of almond butter :)?? This is now my lifelong favourite cookie! I used sprouted spelt flour and peanut butter and they turn out amazing every time. Sooo delicious. Weirdly enough I didn’t have any nut butter so I used… tahini, but it worked WONDERS. I brought this to a vegan potluck and everybody loved them. And we loved them so much that we’re doing them again tonight (we first tried them yesterday)! Yum! I’m eating one from the batch I just made. I love the texture and flavor the oat flour gives them! I already did them twice and they’re really good! I am only vegetarian and the rest of my family also eats meat but we all love these cookies! These are amazingly yummy! Thanks so much for the recipe. Made these for a party, they turned out amazing! And I loved telling people they were vegan! I notice that a lot of your baking recipes call for coconut oil. Do you have a go to replacers? Bananas maybe? I LOVE your recipes! Hey Emily, You can try vegan butter :) Mashed banana might work too, but it really depends on the recipe! Can the sunflower seed butter be subbed out? Preferable without any nut or seed butter. I so appreciate your advice on this…. Made these last week – my husband kept going in the kitchen and coming out with three at a time! I’m surprised I got to eat any of them. I love how simple it is, I’m so making this for my birthday! I’m always reducing sweeteners because of health issues for my family. Does the “finely chopped dark chocolate” mean a candy bar or unsweetened dark chocolate bar? I was thinking about trying these with half the sweetener cause of sugar issues for my family. Hi Deborah, I usually use a 65-70% dark chocolate bar – any brand will due. Just check to make sure it’s dairy-free if that is an issue for you. Hope this helps! Just made these last night. They are so good!! Best cookie recipe I’ve made since switching to a plant-based lifestyle a year and a half ago. Every recipe I’ve tried from Oh She Glows has been so delicious! Thank you, Angela! Made these last night and my picky eaters approved of them! next time we will use white chocolate chunks – which probably aren’t vegan but we mix it up. One of my kids has a nut-free classroom, so it’s great to know I have an option for a treat to send that has some protein, is safe for his classmate, and is palatable for him! Working through your cookbook too. Nothing but winners to date. The festive kale salad is incredible! Delicious recipe with easy cleanup! They were so soft and chewy and utterly chocolatey. I live in Phoenix, so I had to put them in the refrigerator or the chocolate chunks would melt even with the air conditioning on. However, I would take one out a little before enjoying it and it would soften right up. I was surprised at how chewy they stayed. I will make these again. You had me at double dark chocolate! Hi, I am making these for my daughter who has a wheat, egg, and peanut allergy. So I am hesitant to use the sunflower seed butter. I am also hesitant to use the coconut oil, but not as concerned as I am about the sunflower butter. What can I use instead? Would regular butter be a good substitute? Thank you! I made these last night with PB in place of the sunflower seed butter and plain ol’ chocolate chips instead of chunks (it’s what I had). They’re exactly as expected, and still chewy/crispy the next day. Perfection, as usual, from Angela Liddon! Just made these for my daughters snack later today and I am in love. So delicious!! I didn’t have cane sugar so I used coconut sugar instead but it worked perfectly. Thank you so much these are delicious, easy to make and perfect! The pictures literally left my mouth watering (like everyone else) and the fact that there’s no animal products used is a major plus. So I tried them out, my consistency looked exactly like the pictures posted here, but they can out super flat and big – which didn’t take away from how amazing they tasted. But I think I added a bit too much almond milk or maybe smashed them down too much. Unsure, but going to give it another shot in a day or two! Thanks so much for your amazing recipes! I made these cookies. I substituted applesauce in place of coconut oil. OMG!!!! These cookies are to die for. Thank you for another decadent recipe. You make being vegan easy. Made these last night, and they are still soft and amazing the next day (and if possible, even more delicious!). I used peanut butter and they fabulous. Have made these 3 times in last 3 weeks… :) a new favourite! I just made these cookies and sweet mother of pearl, are they freakin’ delicious!! I subbed chia for flax since I didn’t have flax, and used almond butter per your suggestion since I didn’t have sunflower seed butter either. Still, a most delicious cookie. I bow to your greatness, Angela! Thank you!! Hi, these cookies look amazing. I can’t wait to make them. I’ve started using maple syrup to sweeten up different foods instead of sugar, is there any way you could replace the sugar in this recipe for maple syrup? I’m not a big baker so I’m not sure if it would ruin it. Usually if you replace a sweetener in a recipe it should be subbing a dry for a dry (such as subbing coconut sugar for cane sugar) or wet for wet (such as subbing agave for maple syrup) so it doesnt throw off the balance of the recipe. If you replace the dry sugar with maple syrup in this recipe, you’d need to reduce the liquid somewhere in the recipe. I’m loving your recipes and I can’t wait to make these! I was wondering if the cane sugar and brown sugar can be substituted with maple syrup, honey or coconut sugar? I have been dying to dry out these, but I have a slight allergy to anything coconut, how can I make these? what can I use to substitute 1/4 cup virgin coconut oil? do you think olive oil would help? I love these cookies!! I made these with a mix of dark brown and coconut sugar, because that’s what I like to do. They were amazing! The crispy exterior is relatively thin, which gives them such a satisfying texture. So glad I found these! My boyfriend loved them, we’re even going to share them with friends. Though we might not mention their vegan/health qualities until after they’ve tasted them! I loved them with the sunflower seed butter, it’s one of my favorite butters. The nuttiness goes so well with the oat flavor. I’m going to try them with peanut butter next! I’m sure they’d be great with any kind of butter! PS. I really love carnival cookies. My boyfriend also requested that the next batch feature colorful candy coated chocolates. I’m sure they’ll be great, I love how these aren’t too sweet! do you think i could sub the chocolate with cocoa powder? and if so, how much? thanks! These cookies taste as good as the photo looks. Excellent it you need to get your chocolate on. These were great! Thanks for sharing. These are AMAZING best cookies I’ve ever made I couldn’t stop eating the cookie dough, making a double batch tomorrow!! Anyone know if I can cut out some of the oil and use apple sauce? First time commenter, although HUGE fan of yours (and have recommended your book to all of my friends and family). These cookies are divine and my husband and I have gone through the whole batch in just a few days. I made a couple of very minor changes: used almond butter, 1/2 cup of raw sugar (instead of the 2/3 cup brown sugar/raw sugar mix), and used semi-sweet chocolate chips instead of the dark chocolate bar. Baked for exactly 12 minutes and they were perfect. I think next time (which will likely be in the next few days, let’s be honest) I would cut back the sugar just a bit more – perhaps to 1/3 cup. Thanks for a fabulous recipe! Just stumbled upon your site and your recipes look amazing!! Do you happen to have nutritional information and calories for them? Hi! What do you think if I use pumpkin butter ousted of sunflower one? Thanks! And many cheers from Italy! Stumbled across this recipe because I was looking for something quick and healthy for my sweet tooth husband. This recipe is an absolute keeper! I cut out the 1/3 brown sugar because hubby is getting a belly and they still taste good,. They didn’t flatten as nicely like in your photos but still chewy and oh so delicious. Thanks for a great recipe! OMG these were sooooo good! I forgot to add the baking soda and they still came up amazing! Will be making again and again, thanks for the recipe! I’m a big baker…and these are one of my favorites to whip up. Comes together with a delicious flavor and texture. Sadly I don’t have sunflower seed butter but I’ve done it both with almond butter and cashew butter. Next time I’ll spring for the sunflower seed. Thank you for posting! These were awesome – so so yummy. Only lasted 2 days. I used chocolate chunks because that’s what I had on hand. I’ve already purchased 2 dark chocolate bars with plans of using them in subsequent batches – I got the Green & Black’s espresso bar and the G&B toffee bar. I have high hopes for these cookies! I am so grateful for your recipe! These are so delicious! We were fighting over the last one! Have you tried baking them smaller with less cooking time? I want to make some for a potluck and would like to have more of them. These passed the family taste test: everyone loved them! They look great too! Oof. Not sure what I did wrong. The dough came out SUPER crumbly, and i had to add quite a bit of milk for them to get a consistency similar to what is shown in the picture. Probably due to this they are quite a bit more cakey than I expected. Any suggestions? Thank you! Wondering if these would be ok with all the sugar replaced with coconut sugar? My husband cannot have sugar, only stevia. Can I substitute in this recipe, and if so, how much stevia can I use? Just made these but overread that I had to process the oats (oopsie…) they look heatlhier now. And I prefer using less salt but other than that they turned out delicious! I am bringing them to my friends´ house now. Can´t wait to hear what they say. These are soooo good can’t stop eating the cookie dough! Have made these a few times now tried once with while all purpose flour and they weren’t quite as good even my bf who loves them noticed definitely sticking to oat flour. will using coconut sugar in place of brown sugar give similar results?….I don’t mind them being a little less sweet, but don’t want to mess with the gooey and crispy on the edges. These are delicious! Anyone have storing suggestions? I want the! To taste just as fresh and same texture on Xmas(2days) thanks! Holy smokes these were amazing! I subbed carob powder and chips and it turned out wonderful. Also used crunchy sun butter and gave it a lovely nutty texture. For somebody who has to avoid both chocolate and nuts, was such a treat! This is a keeper. I can’t say anything that hasn’t already been said — these cookies are fantastic! 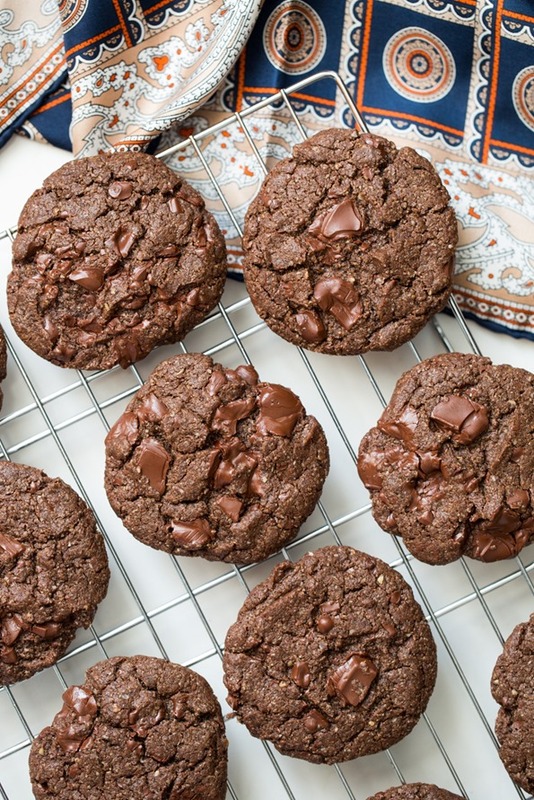 Thank you for the recipe; it is my new go-to whenever I need a chocolate cookie fix. Have just popped these in the oven for wonderful husband and I. I left out the cocoa and put in a teaspoon or so of raw cacao and also left out the second batch of sugar. Here’s hoping! Thanks for the idea. I have never before in my life made cookies and am feeling still festive! We are vegans so have not indulged much at all over Christmas. My mix only made 9/10 cookies but I am hoping they will come out good. Thanks Angela. These look amazing! Just wondering, do you think this recipe would work with something like applesauce or mashed banana replacing the coconut oil? Just finished making this recipie and I have to say it is 150% a winner! These cookies are amazing! These are awesome. Crispy on the outside, chewy on the inside. I used a cookie scoop for the dough and pressed them a bit with a glass dipped in sugar. Made 18 cookies for me. Delicious. Thank you for sharing this recipe. oops, i forgot! 5 stars! I made these today with homemade almond butter and mini chips from Enjoy Life turned out awesome. I even posted a comment because of it. Thank you for the recipe! Instead of the oat flour I used coconut flour and it works just as fine and gives it such an amazing coconut flavour! Definitely a suitable alternative. I just made these cookies for dessert and they were a hit with my boyfriend and I :) The only change I made to the recipe was that I used almond butter since I didn’t have sunflower seed butter, but I’ll definitely try sunflower seed butter next time. Thank you for this wonderful, allergy friendly recipe! My son has multiple severe food allergies, and this was perfect for us, no substitutions needed. The cookies were approved by our whole family and friends! As good as conventional double chocolate cookies, better in my opinion. I used Enjoy Life chocolate chips. I’ve just baked up a batch & oh my word, they are DEVINE! Thanks so much for the recipe. I didn’t have the seed butter so I modified it a tad & added a little extra almond milk. Worked perfectly! Just made these for a girls weekend, and they are fabulous :) let’s hope I don’t eat them all before I leave for the weekend! :) thanks for the amazing recipe! I used natural peanut butter (with sea salt), and it was perfect. Not too peanutty at all! The sweetness of the cookie really offsets super dark chocolate chunks-I used 85%! We made these last night and they are great! My husband loved them too. I have made so many of your recipes that I decided to buy your cookbook. Everything I’ve tried has been delicious! Thanks so much! These cookies look amazing. Every time I visit your blog they catch my eye. Must make them later this weekend. Looks like a recipe that needs to be included in the second cookbook. I just made these!! Eating the first one now and it’s delicious! Thanks, Angela. They were super easy to make :) I followed the recipe (almost) exactly as I only had peanut butter on hand and not sunflower butter. Do you think chick pea flour could be substituted for the oat flour? Just to add some protein to these tasty little bad boys? These are so good. They taste decadent. Even my 15 year old who is not happy with my transition to healthier choices gobbles them up because they taste just like conventional butter based cookies. Can you use carob chips in place of the dark chocolate? Will it taste just as yummy? If I do decide to use dark chocolate, which percentage of cocoa do you recommend? Hey, just wondering what your thoughts are on adding a couple scoops of chocolate protein powder to this to up the protein intake? Im wondering if I add more protein, what liquid would you recommend adding more of to compensate? The almond milk perhaps? Thanks!!! Ps I love your blog! Curious is you ended up adding the protein powder?? I was going to add a scoop of chocolate protein powder when I made them tonight but chickened out. would love to know how they turned out if you did. I did end up adding one scoop of chocolate protein powder to half of the batch, and then leaving the other half as is for reference. To be honest, I preferred the ones with the protein powder! They were chewier, and when I froze them, the ones with the protein powder never froze as hard as the ones without. I would say to just be sure to chose a protein powder that you already know tastes good, cause I’ve baked with ones that tasted chalky and the results weren’t as good. Also, I just added a bit more almond milk to make up for the dryness. These are delicious!!!! My 9 year old daughter and I just made them together and they were a hit with all the kiddos! Super easy too. We subbed peanut butter and they came out awesome. Thanks for the yum time! I just thought of a substitution for sunflower butter. I was about to make my own, then I figured I’d use tahini (which I have a ton of) instead. I’ll let you know how they turn out! I’m going to shape these into footballs and add icing laces for a Super Bowl party. This recipe is perfect as I have a lot of people with different allergies (soy, nuts, and gluten). These are the best GF vegan cookies. I have tried many different recipes looking for a “cleaner” cookie and this one hands down is the BEST! I use a mint dark chocolate bar. My hubby and kids can’t get enough. Thank you! It could be, but hard to say! Recipes are like little experiments. Whenever I want to increase the thickness of a cookie I do one of two things: 1) Increase the flour by 1-3 tbsp, OR I reduce the liquid. It’s trial and error. Goodluck! Try just using 2TB of water in the flax egg. That should plump them up. I made these for friends, and no one had any idea they were vegan. So delicious; moist and crunchy at the same time. I will definitely be making these again. If you are a chocolate lover, these are the cookies for you! My husband had a twinkle in his eyes as he was tasting them! Soooooooo good!!! I used peanut butter because I love peanut butter with chocolate and I had to use a mixture of coconut oil and vegan butter (I ran out of coconut oil!). Easy to make and taste is incredible! Making these as we speak. How do we store them? Airtight container at room temp? How long are they good for? Not that they will hang around for long! I made heaping 1 tbsp portions as I like a smaller cookie and wanted a larger yield. Just made these and they were chocolately and gooey. I used half coconut flour and half almond flour. Also used only 2TB of water in the flax egg bc I like a gooeyer, thicker cookie. I also used almond butter, sucanat and coconut palm sugar. They were a bit crumbly so I eyeballed some almond milk. But they did not disappoint! So good straight from oven. Hi Angela, These cookies are delicious! My daughter is vegan and my nephew with IBS is gluten-free, nut-free, and dairy-free. How wonderful to have a real cookie like this for a treat. I have one question for you. My cookies do not spread like yours did in the photo. I tried adding more non-dairy milk and thought about decreasing the flour a little. Any suggestions? Thanks again for the recipe! I work for Maine Huts and Trails, a backcountry hospitality hut system connected by a groomed trail system, in the mountains of Western Maine. We feed and house 40+ guests on a regular basis and part of keeping our guests happy involves keeping the cookie jar well stocked. 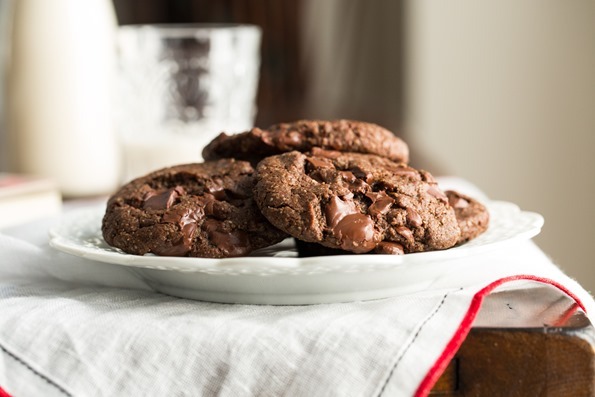 After watching the movie Chocolat, I was inspired to give these cookies a try and I am so delighted to report that they were and absolute best-seller! Fresh out of the oven these cookies were ooey-gooey and moist and so, so heavenly — something that rarely happens with gluten-free baking because my normal flour mixture with added xanthan gum has an off taste that goes away as the cookie cools. So what a delight to eat a cookie right out of the oven! I baked a triple-batch and they were gone within 48 hours. **Just for the heck of it, I added about 2 cups of Chopped Walnuts. So the cookies I made were not Nut-Free, but they were absolutely delicious and still Gluten-Free and Vegan. Thank you again for such a delicious and smart cookie recipe! Just made these. They turned out so well even my carnivore boyfriend loved them and I’m not even a good baker!! I used a flavored dark chocolate candy bar as the chocolate chunks. These are just awesome, thanks for the recipe. I cannot wait to share them at work. I made these tonight and they were amazing!! I am a mostly raw vegan and very rarely make sweets, but I have a feeling these will be my go to dessert whenever I have a craving for chocolate! Thank you for this amazing recipe!! I made these today and they are super yummy! I sprinkled mine with a little sea salt before going into the oven, mmmmmm….I make sunflower seed butter in my vitamix because it’s so much cheaper than buying a jar of it. This time I made it specifically for this recipe and it was well worth it. It’s Valentine’s Day today and I really needed a chocolatey treat. These were perfect and even better is that my hubby liked them too. Thank you! Hi, looks awesome! I was wondering, is it possible to make them with brown rice flour? Thank you, thank you, thank you! My son has a variety of allergies that make vegan baking the best option, with the exception of nuts. I love your blog and cookbooks, and am so glad you are adding to your nut-free dessert options! These look amazing! Question – what if my coconut oil is already melted (Australia = hot = always liquid coconut oil! ), will it make too much of a difference? I just made these cookies with my almost two year old daughter and if only you could see the pictures I took of her eating one of them! They are really good. I substitued the sunflower butter with almond, it’s what I had at home. Congratulations on creating such a great cookie! Just made these. So yummy! I had no brown sugar so added maple syrup instead followed by some coconut flour as it got too sticky. They turned out great. Thank you. I just made these and they are phenomenal!! I doubled the recipe, used real eggs instead of flax eggs and green and blacks 85% dark chocolate bars. They ended up needing about 1/4 cup almond milk so next time I may use three eggs instead. I also made them half the size suggested and the batch made like 50 cookies! What a winner. These are by far the best cookies I’ve ever made. Just made this and made a blogpot about it. So good! Thank you for the recipe. These are incredible! I know they’re easy to make because my husband actually made them for me when I was sick and he doesn’t bake anything. You wouldn’t know these were vegan. These will always be our go to cookies. Made these cookies and they were absolutely amazing! I used plain peanutbutter as a substitute and used chia seeds as an egg substitute instead of the flax ( didn’t have it in me pantry) and they added a little crunch to it. My husband ( not a vegan ) devoured these. Thank you so much for the recipe! These cookies are so good! I hope you upload some healthier cookie recipes as well! Absolutely delish! Didn’t need to add the liquid….they formed perfect little balls which turned in to lovely, crispy-on-the-outside soft-on-the-inside chocolate dreams! BEST g-free vegan recipe I have ever tried. And all with things I already had in my kitchen! Thank you! Seriously, Angela. These cookies are bananas. SO DELICIOUS!!! Angela, thanks for the wonderful recipe! I made several substitutions and was worried the final product wouldn’t turn out as beautifully as your pictures, but they are perfect. I used organic, cold-pressed sunflower oil in place of the coconut oil (because my local store was out), almond butter in place of sunflower butter (I live in Italy and have never been able to find sunflower seed butter here), quinoa flour in place of the oat flour (because I made them for a friend with celiac disease and I was unable to find gluten free oats or oat flour) and finally, an egg (because I didn’t have ground flax on hand and I’m not vegan anyway). I was particularly worried about the quinoa flour, as the raw batter had a strong smell to it that was a little unappetizing, but the baked cookie is soft, gooey, super-chocolately and just the right level of sweet – the flavor is great and the quinoa taste isn’t overpowering at all. I can’t wait to share these with my friend! I love all your recipes and think your website is awesome! You’re doing a real good job of writing everything up. Today though when looking at this recipe I scrolled down and accidentally clinked the link advert and nestle promoting some product ‘care’ for women and children popped up. I understand you need adverts to make a business out of this but I’d just like to make you aware Nestle is one of the worse corporate companies out there. You really don’t have to shake hands with them to become successful. They do evil things to the environment and women. Nestle also donated over $1million to help block GMO labelling. Your recipes are the very opposite of corn processed food, why support a company who aligns with that? A company that thinks it’s okay for customers not to know what they are actually eating. They know they can fool people who aren’t as educated. Anyways I hope you don’t mind just wanted to make you aware, especially as your recipes are so awesome for health, nutrition and families! Love all your recipes! I use your book or blog on a weekly basis for meals or treats! My youngest who’s almost 4 enjoys baking with me and eating your treats. But her school have a no nuts policy. And living in Kuwait, I can’t get hold of Sunflower Seed Butter. Do you think it work with sesame seed butter? Or more coconut oil? Or a vegan butter? These are INCREDIBLE!!! I made a batch tonight and thankfully I have enough ingredients to make another batch tomorrow because they are going FAST (and here’s where I shamefully admit that there are only two of us here making them disappear!). Thank you Angela, you are a genius! I have these in the oven right now. The batter was delicious; I anticipate even better from the freshly baked cookies! You are a great baker. These are my new favorite cookie! I tried these and they came out super dry! Any suggestion as to why they may have come out this way? Made these with the peanut butter option instead of sunflower seed butter, they were SO DELICIOUS!!! This recipe is definitely added to my list of favorites! Thank you! Hi, I’m new to your blog and searched for a recipe for choc chip cookies and this came up. I’m wondering what I can substitute for the coconut oil. Are there any nutritional information for this recipe? Calories?… Please let me know as soon as possible:) Thanks. These are super great. Just made them with my 4-yr-old son and, in his own words, “these are so good! They are TOO good!” I got 18 giant cookies out of this batter. Don’t skip the cooling step – they crumble a lot pre-rest and firm up considerably after resting (even more so than conventional cookies). Used chocolate chips instead of a bar and used 1/4 cup brown sugar instead of full third. The coconut oil (and maybe coconut milk, which I used to loosen the dough a little) + oats give it a subtle granola quality. Thank you! This looks absolutely awsome! I adore cookies with chocolate! These are amazingly delicious! A big hit with my whole family. Thank you so much for your wonderful recipes. I’m making these right now and I don’t know how many of them are going to make it into actual cookies! lol The cookie dough itself is AMAZING! Very excited for the end result. I would love to add peanut butter but that would mean the kids can’t take them for school. I have a batch in the oven right now. I was wondering if there was another substitute for the sunflower butter, than a nutbutter? If you use Almond butter it will still be nut free too. Almonds are not nuts they are seeds. I have friends that have allergic to nuts but can have almonds. I’ve made these cookies twice. The first time just as you listed. They were really good. Kid & husband approved. My 7 year old said they are the 2nd best cookie he has ever had! The second time, I doubled the recipe and replaced the sugars with 8 pitted & pureed medjool dates and 2 tbsp of maple syrup. I was out of chocolate chips so I used raisins and added about 1/3 cup shredded unsweetened coconut just because I like it. The cookies are still kid approved, but not as sweet as your original recipe. We adults prefer the original recipe, but as I am trying to reduce cane sugar where ever I can, the dates & maple syrup are a decent replacement. Although, the chocolate chips or chunks are a must. As an extra special treat, we spread coconut whipped cream between two cookies for a decadent sandwich cookie. Freeze the sandwich cookie for a few minutes if the cream isn’t thick enough. Thanks for the great recipe. It was fun to make the original and to experiment with it. These cookies look amazing! I will be making these for a friends graduation party next week, thank you so much! I just made these and I have to say, they were the easiest most delicious cookies I’ve made thus far!!! Thank you for this recipe!!!! I have made these twice and I’m a little disappointed. Both times they turned out more dry and crumbly, even when I added more coconut oil. Maybe the oats are the culprit since they tend to absorb a lot of moisture. The cookies look so lovely in your photos though and the dough was very moist. Any suggestions? These are the best cookies I’ve ever tried! Sooooo good! These cookies were amazing. Just wondering can you make the dough in advance and refrigerate. And secondly if I am making large quantities (40 dozen) what proportion of baking powder and baking soda would you recommend? Made the cookies….they’re fantastic!! However, they got hard after a couple of days. What’s the best way to store these cookies so they stay chewy after 4-5 days? I just made these. I made my own oat flour in the Vita Mi, used Jif Creamy peanut butter and a Baker’s Semi Sweet Chocolate bar since that’s what I had on hand. I mistakenly added 2 Tablespoons of (So Delicious) coconut milk instead of 2 Teaspoons but it seemed to work anyway–they’re probably a little flatter than they might have been. They have a great flavor. I baked them for 14 minutes and they had a crisp edge but soft inside. Thank you for a great recipe. Wow, these are the PERFECT cookie! I was craving something sweet last night and these were perfect and came together so quickly with all ingredients I had around! It was kind of late and I didn’t want to be super loud so my oats didn’t get pulsed all they way and were still a bit chunky, but that gave the cookies amazing texture… will definitely make these 100 more times! These cookies are absolutely incredible. I knew the baked cookies would turn out great, after I found myself unable to stop eating the batter. I’m making my second batch now, because the first ones were eaten up so fast! Thank you SO MUCH! just made these cookies and they’re soooo good! i subbed cane sugar with coconut sugar and used crunchy peanut butter instead of sunflower seed butter and oooooh myyyy gooooosh i’m drooling. but, to my question: can you freeze these once they’re baked? These are amazing. Thank you for the recipe. Mmmmmmm I just made these! YUM! So delicious, love that it’s straightforward! Thank you! Every time I get a craving for cookies, I always come back to this recipe. They are sooo good! Awesome cookies. My boys, nephews and nieces were drooling and so excited when they’d finally ate them. Delicious! Those are the best “healthy” cookies I have ever made and tasted. I find however they are so bloody sticky when making, is it normal or I am doing something wrong!? I made these at the weekend and they are without a shadow of a doubt the best vegan cookies I have tried to date (insert heart eyed emoji) They are so decedent and chocolately its hard to believe they are vegan, I have only recently started a plant based diet and these don’t make the move so bad :) Thank you Oh She Glows!!! Just made these with a few modifications and they were fantastic! These were amazing! I made them with almond butter and didnt need to use any soy milk. SO rich and perfectly chewy. The first succes Ive had with any glutenfree vegan recipe. I just made a TRIPLE BATCH of these for the first time ever today! I’m bringing them to a vegan/vegetarian potluck at my Uni. for the WWF club social! I also made some substitutions to the recipe and it worked out great! I like baking oil free, so I swapped the oil for organic apple sauce, and the sunflower seed butter for natural peanut butter. So this recipe could be gluten, nut, oil free and vegan! CRAZY GOOD. I had to add the additional table spoons of milk (I used unsweetened almond) but then baked ’em up and they turned out amazing! Just made these and they turned out so delicious!!! Thank you! Thank you for including instructions on sizing the dough as it’s placed on the cookie sheet. So free recipes have that. It’s really helpful! could I freeze the batter then bake them for a little longer later? I want to bake a few of your recipes to make my boyfriend a vegan hamper for valentines, and it’d be a lot easier if I could make the batter in advance rather than the day before? If so, how much longer should I bake them for? I made these on a whim last night and I’m so glad I did! I was short on a couple ingredients, but it didn’t mater. Instead of flax (I basically never have this on-hand), I combined 1/4 banana with baking powder. Worked great! I also didn’t have a chocolate bar, so I used 1/3 c cocoa powder. They were so gooey and delicious! Thank you! Great, easy recipe! These cookies are delicious. I am entering them into a cookie bakeoff at work today and all my taste testers agree this is a delicious cookie! Hi Sean, I’m so happy to hear you and your testers like the cookies. Good luck at the bake off!! These are SO good! 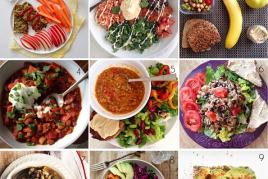 I am not even vegan but I love all of these healthy recipes and desserts! I’m currently on my second breakfast cookie!! These were amazing. I also added a half cup of chunky peanut butter to merge this recipe with your other one. I cheated a bit and used an egg and butter alongside the coconut oil. The results were awesome! Yum! Glad you enjoyed the cookies, Niamh. Do you know any good substitutes for oats or oat flour? I’m sensitive to that and so many GF recipes include those ingredients. Thanks! It is Sunday night on a warm spring night in Victoria but I just had to turn on my oven and try these cookies. OMG am I glad I am single! More cookies for me! These are delish! YUMMY! Oh my gosh, so good! All mine! Ha!Ha! My flaxseed was toasted which is probably not ideal but the chocolate flavor is so intense it doesn’t matter! First time using flax egg, too. Dang, hubby (who doesn’t follow my diet) just tried one. He likes it! No! he has his processed junk food, these are supposed to be fo me! ? I made these last night and we all loved it (Family of 5 plus Granddad). While I picked Dad from the train station my 5 year old stayed at home with granddad and shaped the dough into little balls and pressed them slightly with her finger. They stayed in the oven for 15 min at 180C. They ended up with the shape of a turtle shell after baking and were gooey-ish in the middle. Delicious! We used half the sugar (nothing wrong with the amount suggested on the recipe we just prefer less sweetness). hello! i made these cookies last night and they. were. DELICIOUS! they were soft and chocolatey and just perfect. however, i did make a few amendments. i wanted to enjoy these “fat” free so i elimanated the oil completely and subbed apple sauce instead. also, i used raw, unsweetened cacao powder since i don’t have cocoa. because the cacao is bitter, I had to add one extra tablespoon of cane sugar. the dough turned out very, very sticky for some reason, i didn’t even add almond milk. so, I had to add an extra 1/2 cup oat flour. all that said, these were just amazing. couldn’t have asked for better. thanks Angela for another great recipe! Hi Valerie, These cookies are on the heartier and drier side (thanks to that hearty oatmeal base!) so my guess is that they might not freeze very well (although I haven’t tried it yet myself). I remember they were best enjoyed within a day or two. Please let us know if you try it out! I just made these AWESOME! cookies and I had to leave a comment on how great they are. This is my first vegan Chocolate cookie that I’ve made. (I made vegan peanut butter cookies before) I did use Earth Balance vegan butter instead of Sunflower butter. Still turned out great! Just wanted to tell you and everyone else how Awesome they are! Thanks Angela? Thanks so much for the “glowing” (haha) comment Sheila! It’s great to hear the cookies were such a hit. Enjoy!! Outstanding cookies! Just made these for my grandmother to have with a lovely coffee after lunch and she was thrilled! Thanks so much for the recipe! I added walnuts and subbed sunflower seed butter for peanut butter and they were fabulous. This is my go-to cookie recipe. Can’t count the number of times I’ve made them and they are perfect! This looks amazing!! Can I substitute either of the sugars (brown or white) for coconut sugar? I don’t want it to change the recipe too much! Thanks!! Hi, can I substitute coconut butter in for the sunflower butter? Thanks! These look delish. About to make them for my clubs first meeting to share with everyone. Kids wanted cookies…quick. I love your website and have faithfully used your recipes for years. Unfortunately, for health, I have to be AIP now (no gluten, grains, legumes, dairy). I still find your recipes inspiring though. 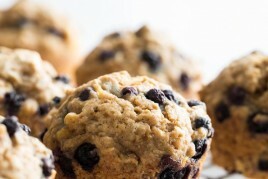 I had never used flax eggs before but my daughter thought these looked delicious. We whipped them up in no time and I did not feel guilty about my 3 year old eating a spoonful before they were cooked. Overall, they family said they were awesome. We will be making the recipe again; however, I was going to try to modify it for AIP (ie no oatmeal or nuts). Fingers crossed. This recipe is excellent. I used peanut butter and chocolate chunks as well as chocolate chips and it was delicious. Thanks! I’m glad you enjoyed them, Jody! I make these ALL the time, and they’re my go-to potluck/neighbor treat, too. I’ve made them with sunflower butter as indicated in the recipe, and also with almond & peanut butter, and they’re fantastic all three ways. Thanks for such a wonderful recipe! These are the best “healthy” cookies I’ve tested in my kitchen! I’m a pastry chef, on my journey towards creating healthy, GF, vegan (etc…) for my friends, family and clients. I’ve replaced the sugars with coconut sugar and used a fine quality 70% dark chocolate (reduced to 70 grams), and made 16 quite big cookies! Everyone loved them and couldn’t believe they’re butter/ refined sugar/ egg/ gluten free. Thank you so much. It’s a first attempt with your recipes and am looking forward for all that’s next. Oh, thanks so much for the lovely comment Dvir! I’m so pleased to hear you’re a fan of the recipe. These look amazing! Does anyone have the nutritional info for one cookie? I just made these and loved them. Made a few tweaks – 1/2 c. coconut oil (no seed butter), coconut sugar in place of brown sugar, some molasses, and 1 cup unbleached flour – 1/2 cup almond flour. So glad you enjoyed the recipe, Shannon! Thanks for sharing those tweaks, too :) it’s always so helpful! I have a bag of super fine ground almond flour. Can I substitute it for the pay flour? Thanks!!! Made it with peanut butter and can’t taste it. I’ve made these many times now and they are always a hit! Question, can I refrigerate the dough for a day before baking? Hey Sofiya, I do think you’d be able to chill it for a day! My only suggestions would be to wrap it tightly so it doesn’t dry out, and to let the dough come to room temperature before baking so they still spread out nicely (unless of course you’d like thick cookies) Enjoy! Hi. These look amazing! Really want to make them but don’t have any type of seed or nut butter in…. could I use vegan butter as a substitute? Hi Ella, Thanks for your question! Unfortunately, I don’t think swapping nut/seed butter for vegan butter would yield very good results with these cookies, as the two ingredients have different properties in terms of taste, texture ,and so on, and vegan, gluten-free recipes tend to be pretty sensitive to significant changes. I worry especially that they might end up rather crumbly…the nut butter works as a great binder. I hope this helps! I want to thank you for a recipe that is very good just as is and appreciate your efforts to make these cookies chewy and delicious. I stopped all wheat 6 weeks ago and feel amazingly better physically and no more depression! This is the first baking I have done. Very satisfying even without the extra chocolate chunks, which I left out because the stores are half an hour away and I couldn’t wait to bake these! Incredible! Will definitely be making again. Subbed sunflower butter for almond butter and they turned our perfectly. Hey Rachel, That’s great sunflower seed butter worked well for you. Thanks for letting us know! These cookies have passed NUMEROUS non gf/non vegan taste tests. People LOVE them and are astounded to find out they’re vegan/gf. Modifications: No need for mixer. I add a bit more salt sometimes. I always add a few tablespoons or so of nondairy milk and bake them only 8-10 minutes for gooey-er cookies. I think oat flour works better than ground oats (I don’t have a strong food processor/blend). Peanut butter works, but I prefer the sunbutter! Hey Sarah, Ah, don’t you love when that happens?? I sure do. :) Thank you so much for sharing your tweaks! Next post: The Oh She Glows Cookbook Launch Day + A Special Sneak Peek!